Doctorand: Antepara Zambrano, Oscar Luis. 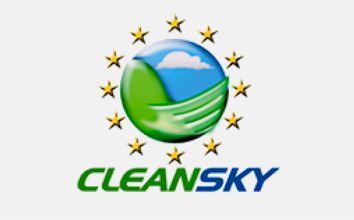 Participants: CleanSky, UPC, Baltogar S.A.U, TF. Summary: In all-electrical aircrafts, the corresponding electrical ram air fan should be optimized in order to improve its current design in two aspects: a)generate pressure drop at low flows without surge issues; b)cooling of the fan electrical motor at high inlet air temperatures. Considering these objectives, a new fan concept will be selected from available bibliographic and consortium expertise, and designed using the consortium skills in deep fundamental fluid mechanics and heat transfer knowledge (Technical University of Catalonia - UPC), advanced CFD tools and aerodynamic know-how (TF) and engineering capacities of a fan manufacturer (BALTOGAR). The proposed design related to surge problem will be implemented in a prototype and tested accordingly. In a similar manner, a solution for electrical motor cooling will be found. The final solution must also consider its impact on the whole ECS pack, in order to maintain its global performance objectives. Participants: Airtècnics. Motors i Ventiladors S.L., UPC, TF. Summary: The main objectives of the project where the optimization of the air curtain discharge plenum. 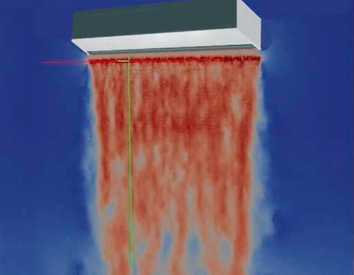 Focusing on a better orientation of the curtain jet and a decrease of the turbulence level of the flow. Hence, obtaining a better energy efficiency product. Furthermore, multijet air curtain where also optimized. 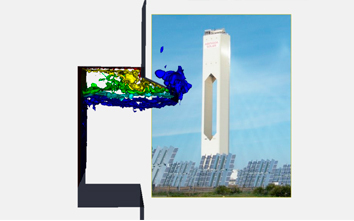 In order to deliver an optimal design of the air curtains, extensive LES simulation of Airtècnic's prototypes using TermoFluids technology and the UPC HPC facilities have been curried out. Moreover, experimental validation of the numerical results have been also successfully achieved. Participants: Abengoa, UPC, TF, etc.